Marriage is one of the sacred and most important pillars of the Indian society. While there is a growing demand for matrimonial sites Indian parents and families still prefer to choose matrimonial matches for their children and relatives through newspapers. 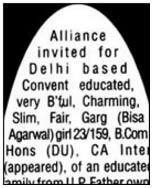 The lack of knowledge of the internet also makes newspaper matrimonial ads more popular. 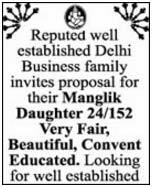 A newspaper matrimonial ad in India can yield better results and can reach out to more people across the country as people from various social status read newspapers. Matrimonial advertisements are published to search for prospective and eligible brides and grooms. Hence, the advertisements act as a search medium rather than focusing on promotion and advertisement. Many families prefer newspaper matrimonial ad in India because it ensures them that they can reach out to more people and speed up the search process in doing so. While online matrimonial sites are more prevalent with youngsters, newspaper matrimonial ads reach out to seniors in the community who are looking for prospective brides and grooms for their children and relatives. These advertisements are usually of two types. The family of the prospective brides usually advertise under Wanted Grooms section where they mention what type of groom they prefer. Similarly, prospective grooms and their families advertise under Wanted Brides section. Some matrimonial ads are further divided into languages and profession and even religion which makes it easier for the readers to read matrimonial ads. Advertisers further specify different preferences and categories which allow them to reach out to their target audience and get a better response. Matrimonial advertisements based on language are further categorized as Assamese, Bengali, Gujarati, Malayalam, Kannada, Kashmiri, etc. In terms of profession matrimonial ads are categorized under Doctors, Engineers, CA, MBA, Advocates etc. These advertisements are usually simple text advertisements that have simple sentences to avoid confusion. Like any other newspaper advertisement matrimonial ads are priced based on the number of words, lines and characters and therefore you need to create your matrimonial ad keeping in mind certain factors. 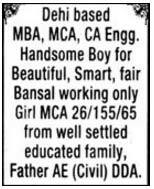 Advertisement for matrimonial can consume a lot of words and affect your budget. Hence, you have to communicate effectively with limited lines and words. Keep your advertisement content short, simple and precise. Include important information like age, caste, groom or bride etc and contact information without wasting lines or characters. Choose your newspapers precisely because that will help you to get better results. If you are looking for prospective brides and groom within the state you must focus on regional newspapers that have better circulation within the state. Also, if you intend to reach out to the particular community you can choose regional language newspaper to make the maximum impact of your matrimonial advertisement. Select categories and classifications carefully because publishing the ad under the most appropriate section can make a huge difference. Readers often look for advertisements under specific categories and therefore you might miss out a large chunk of the audience if your ad is placed under a wrong category. Always provide contact information like an email address that would allow you to handle responses and receive more personal details like pictures and horoscope, citizenship and professional qualifications of the prospective bride and groom. 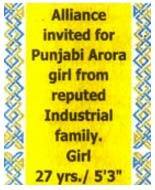 AdvertisementIndia.com can help you book matrimonial advertisements online in various leading newspapers of India. Chauhan girl 27/5'2" convented b'ful working in top MNC Lko. Father Cl-I officer. High status family. E-mail: xxxxx@sify.com …………. Box No. Srivastava Girl 24/ 5'6" B.E. (Elec. & Tele.) PGD (Optical & Mobile) Gori Convent Educated Working in Telecom Co. Contact 0000000, 0000000000. Box No. 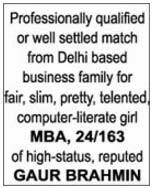 Match for Smart, Fair, Slim Sanadhya Brahmin Girl 24/5'4" M. Sc. (Chem.) Dip. in Comp. (APTECH) Ph: 0522-00000. Box. No. 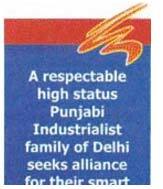 Alliance invited from Civil Services / profly. qlfd / well placed match for Kasaudhan Vaish girl 24/152 gori, v.b'ful, M.Sc. Biotech, convent educated. Father professional. All vaish accepted. BHP must........... Box No. Suitable match for 24/163 fair, slim, beautiful, Manglik Punjabi Khattri. Bank Officer Daughter MA / Nipun in Bharatnatyam. Send BHP.